BEFORE we proceed with the details, here’s why our lawmakers and no less than two former finance ministers have been talking about 1Malaysia Development Bhd (1MDB) in recent weeks: the intriguing sovereign wealth fund that is 100%-owned by the Ministry of Finance has some explaining to do about the way it has been raising cash and spending the money. In a nutshell, 1MDB is under the spotlight because it invests billions of ringgit borrowed at significantly higher rates than market and is deemed to be paying rich valuations to accumulate assets. It also parked some RM18.1 billion with several overseas financial institutions, including US$2.318 billion (RM7.88 billion) in the Cayman Islands, a tax haven, according to a money trail by The Edge in April 2014. And the reason all Malaysians should care about 1MDB’s debt, which stood at RM41.9 billion as at end-March 2014, is because the debt has the implied backing of the Malaysian government. As 1MDB has largely funded its growth with debt rather than fiscal surpluses, operational cash flow or cash reserves, its liabilities have ballooned to RM48.97 billion over half a decade and its RM51.41 billion total assets only provides 1.05 times cover. Foreign investors, in turn, are watching 1MDB because Malaysia needs to keep to its self-imposed 55% debt ceiling and carefully manage its fiscal balance to retain the country’s sovereign debt rating. While Prime Minister Datuk Seri Najib Razak insists that the Malaysian government only guarantees RM5.8 billion of 1MDB’s debt and does not count the rest of the latter’s debt as contingent liabilities, detractors disagree due to an implied guarantee from the government and its 100% ownership. It is no surprise, then, that apart from the opposition members of parliament, the person calling for an independent audit and detailed explanation by 1MDB on its financials is no less than former prime minister and finance minister Tun Dr Mahathir Mohamad, who cited The Edge’s cover story on deconstructing 1MDB’s fundraising in an Oct 27 post on his blog. He was similarly critical of 1MDB in his recent interview with The Edge. 1MDB seems to be paying heed to calls for more transparency on its operations. But there are many unanswered questions still (See infographic on page 66). Take, for instance, the money 1MDB invested abroad. In a surprise Nov 6 announcement, one day after its high-profile late submission of its FY2014 ended March 31 accounts, 1MDB said it has “redeemed a total of over RM4 billion from its investments in segregated portfolio companies registered in the Cayman Islands” and expects to fully redeem the remaining unspecified balance “by November 2014”. RM435 million in dividends from these investments, will be reflected in its accounts for the current financial year ending March 2015, which will be filed by end-September 2015 if 1MDB meets the submission deadline of six months following the closing of its financial year. This redemption is interpreted as the money being brought back to Malaysia, thanks to a statement by Deputy Finance Minister Datuk Ahmad Maslan, who, on Nov 6, told the Dewan Rakyat that 1MDB has repatriated 60% of the RM7.18 billion investments in the Cayman Islands and will bring back the rest by year-end. He also said 1MDB earned 6% to 7% returns on these investments as at end-2013. Ahmad reportedly denied there being a letter of support from the government on Nov 6. However, The Edge stands by its report of there being a letter of support from the government for the said 1MDB bonds and has documents to prove this. Also refuting Ahmad’s denial is PKR secretary-general Rafizi Ramli, who professes to have a copy of the bond agreement and, thus, a copy of the letter of guarantee and last Friday told The Malaysian Insider that he would reveal this week details of 1MDB’s funds in the Cayman Islands. “I will refer Ahmad to the parliamentary special committee for lying in Parliament,” Rafizi reportedly said last Friday, adding that the government is “hiding behind technical reasons” the fact that Malaysians are the ultimate guarantors for 1MDB’s debt. Whether or not the cash has been brought back from abroad to Malaysia, 1MDB stands to lose money from having borrowed sizeable amounts in US dollars instead of issuing ringgit- denominated debt papers at lower costs. Already, the US dollar has appreciated from around RM3 to RM3.20 to the dollar from the time two debt tranches — 1MDB Global Investment Ltd and 1MDB Energy Ltd — totalling US$4.75 billion in nominal value, to RM3.35 to the dollar currently. According to The Edge’s calculations, the depreciation of the ringgit thus far means the two tranches of 1MDB’s US dollar debt already cost RM1.2 billion more to service and repay in ringgit terms. Put in another way, it would have cost some RM1.2 billion less had 1MDB borrowed in ringgit and was able to sell its debt at coupons nearer to the 3.8% that Malaysian Government Securities (MGS) fetched around that time instead of an implied yield of 5.65% and 7.61%. Incidentally, 1MDB attributed its RM665.3 million loss for FY2014 ended March to higher financing cost that rose to RM2.4 billion from RM1.6 billion in FY2013. Going by its RM41.9 billion debt, its implied debt servicing cost is roughly 5.73% for FY2014, up from around 4.42% for FY2013 when borrowings stood at RM36.2 billion. To put the figure in perspective, 1MDB’s RM4 billion debt servicing cost for FY2013 and FY2014 is almost as sizeable as the RM4.9 billion that BR1M payments are expected to cost in 2015. 1MDB’s RM2.4 billion debt servicing cost for FY2014 is also nearly 10% of the RM24.4 billion that Malaysia’s federal government debt servicing cost is estimated at for 2015. And because its operating cash flow still lags its expenses, 1MDB can ill afford to be lax on cost control. In the absence of RM896.8 million revaluation gains, 1MDB would have posted a RM1.56 billion loss for FY2014. Similarly in FY2013, its loss would have widened to RM1.85 billion had it not been for RM2.7 billion worth of property revaluation gains that dwarfed almost RM1.2 billion write-offs that resulted from having overpaid for its power assets. The RM1.2 billion write-offs were part of the RM2.6 billion goodwill for its power asset purchases, which in accounting terms means the amount overpaid versus fair value (see accompanying story). Some RM1.84 billion of the goodwill was from its purchase of billionaire T Ananda Krishnan’s Tanjong Energy (Powertek Energy) and another RM787.35 million in goodwill was from its purchase of Tan Sri Lim Kok Thay’s Genting Sanyen Power Sdn Bhd. 1MDB insists that it is doing a national service by acquiring power assets. Yet, because concessions for first generation power plants were near expiry and 1MDB rushed to raise expensive debt to pay for the assets, experts question its investment rationale. Why rush to raise expensive debt when 1MDB is 100%-owned by the Ministry of Finance? Does 1MDB really need to buy a track record to move into the power business when it is a government-controlled entity? If longer-term returns for moving into the power business are indeed higher, why not show the public that its move makes sense? It does not help that the fees attached to some of the debts raised for its power asset purchases had drawn international media attention for the abnormally high payback for investment banker Goldman Sachs. While 1MDB insists that the high coupon was because it was raising debt on the back of a challenging global environment in 2012 and pre-general election overhang in Malaysia in 2013, statistics showed that investors have no problem picking up Malaysia’s ringgit-denominated bonds offering at much lower coupons. Malaysia’s capital market was flush with global liquidity, seeking comfort in yields. If indeed the fee 1MDB paid to Goldman Sachs was reflective of its risk profile, then surely there is need to objectively review whether 1MDB is achieving the purpose it was set up for. Bank of America Merrill Lynch’s economist Chua Hak Bin, for one, describes 1MDB as “an unusual creature [that] is difficult to categorise”. “1MDB remains somewhat of an enigma and will be closely watched, given its fast-growing leverage and aggressive expansion,” Chua says. “It is not as constrained as a government-linked company like Telekom Malaysia Bhd or Tenaga Nasional Bhd and can readily tap on the government’s balance sheet and guarantees. It is not exactly a typical sovereign wealth fund which invests funds derived from central bank reserves, fiscal surpluses or natural resources,” he told clients in a note in May this year, adding that “most sovereign wealth funds are not so highly geared”. More importantly, Chua rightly surmised that 1MDB “is not exactly in the provision of public goods and services” and competes directly with the private sector as it invests heavily in areas like power generation and property development. In the case of 1MDB’s RM1.38 billion acquisition of a 234-acre encumbered land in Air Itam, Penang, earmarked to build 6,666 low-cost flats and 3,333 affordable homes — in what some parties see as a pre-election promise by the ruling coalition — The Edge’s calculations show that it is mathematically impossible for 1MDB to break even on the land, unless the properties it builds on the land slated for affordable housing are sold at very high prices. Surely it is common sense that cheap land cost is a prerequisite for affordable housing. 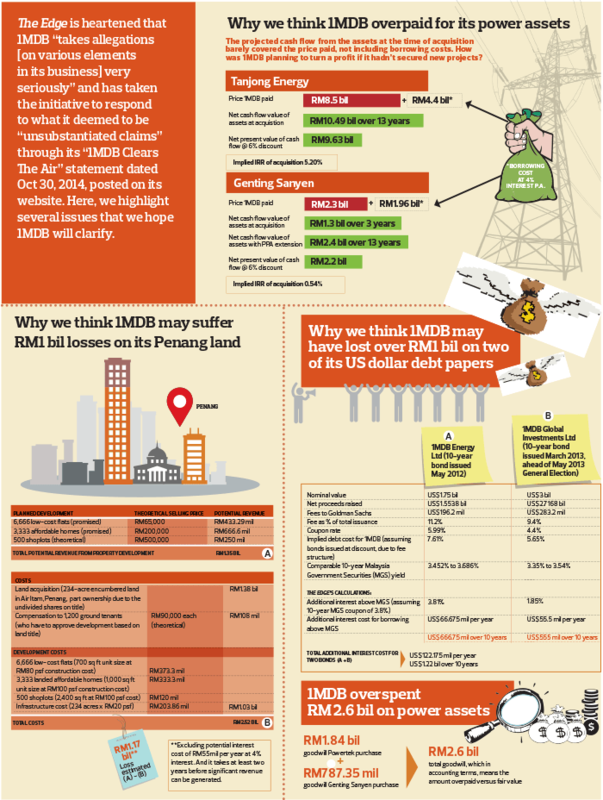 The alternative for 1MDB to break-even on that Penang land would be to sell units in a high-end condominium next to the low-cost development at possibly RM1,600 psf. However harsh critics may seem, nobody who cares about the country’s future would want to see 1MDB go down because everyone will have to pay in some way or another. If 1MDB shares this belief, surely it can understand the need for it to come clean and be more transparent about its dealings and investments. If it has nothing to hide, why not engage the public? It is, after all, wholly owned by the MoF and the government is answerable to the people. This article first appeared in The Edge Malaysia Weekly, on November 10 - 16, 2014.